Lunch like an Earl: The sandwich is everyone’s favourite quick fix. The year 1762 was probably one of the most significant years in British culinary history. 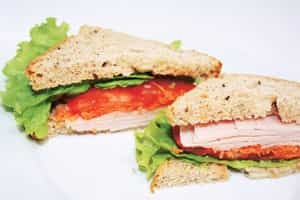 The sandwich was created as gambler John Montagu, fourth Earl of Sandwich, called for his dinner to be put between two slices of bread so he could continue his card game with one hand and eat with the other. Lunchtime in Britain has never been the same, and the sandwich—judging by the dozens of swish places to eat them or pick them up all over London—is clearly one of the most popular British culinary achievements ever. Having just returned from a short trip to London, I am astounded at even more fabulous food places “to go". Not content with the famous sandwich chain, Pret a Manger (French for “ready to eat"), Londoners have now embraced yet another chain, EAT (well, you can’t accuse their owners of any ambiguity or pretensions), and of course the ever popular fantastic offerings in Marks & Spencer, Waitrose and Tesco. And no more is the humble sandwich restricted to something in between two slices of bread. You now have a range of baguettes (crispy French long loaf), croissants, wraps and a plethora of breads from which to choose. Then we have the fillings. Things have progressed beyond BLT (bacon, lettuce, tomato) and cheese and chutney. You can now easily find chargrilled peppers, turkey, mustard-crispy onions, crayfish-avocado, prawn-spinach, salmon-horseradish, asparagus, aioli-artichoke hearts, Brie-cranberry, and the list goes on, getting more creative every time I step into one of these outlets. Even Antonio Carluccio, proprietor of the very successful Carluccio’s restaurants and delis in London, has his favourite sandwich. “Focaccia and mortadella are both typical northern Italian ingredients, and the combination of these with roasted peppers is my favourite sandwich because of its juicy texture and lovely flavour. I use focaccia as the base because it is a great carrier for the other ingredients and there is no need for oil or butter." Sybil Kapoor, Waitrose Food Illustrated cookery-writer, has hers too. “I slice a skinned and boned chicken breast thickly and marinate it in lemon juice, olive oil, chopped garlic and black pepper. Meanwhile, I split some French bread and spread on some mayonnaise and sprinkle with finely sliced spring onions. I cook the chicken on a griddle and, once cooked, place it on top of the spring onions and cover with sliced and peeled cucumber and a little gem lettuce." My favourite quote has to be from the eleventh Earl of Sandwich himself, patron of the British Sandwich Association. “I have been aware since childhood of my family’s responsibility towards the sandwich, due to it being invented by my ancestor, the fourth Earl, in 1762. It is not surprising, then, that my favourite sandwich is marmite and lettuce, which dates back to my childhood. This particular one is very good because, having a very busy wife, there is not much time for more fancy recipes. It must be made with thinly sliced brown bread with butter, and the lettuce must be soft. I do not like any of the modern crispy stuff." The following are my all-time “grab a bite" favourites. Try them. I have taken the liberty of sharing with you what is often my quick lunch at the office, using my own devilishly good Thousand Island dressing. Place equal amounts of onion, olives and tomatoes on four slices of bread. Place lettuce and a heaped tablespoon of Thousand Island and place the second slice of bread. I give a little latitude to using Thousand Island since there is no butter in this sandwich. Use the best brown bread you can find. Put tuna into a bowl with garlic mayonnaise and smash with a fork till you get a paste-like consistency. Add gherkins and as much Tabasco as you like. Place a large dollop on a slice of brown bread. Place a leaf of lettuce on top and the second slice. Cut the bread edges off, if you want something fancy. Otherwise, just cut the sandwich into two diagonal slices.